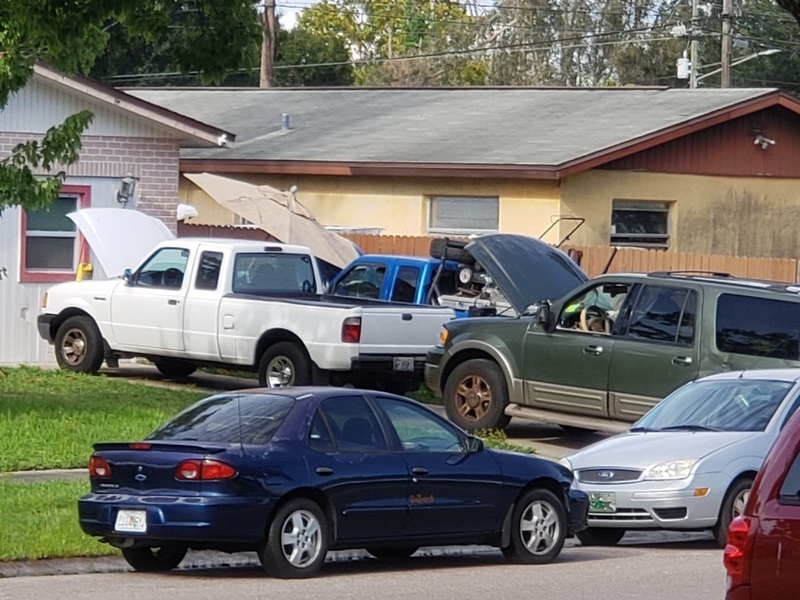 Working on vehicles again in his front yard. Has 3 cars out there today. The green truck has been parked in the road for at least a couple days. He apparently didn't finish fixing it because its still out there this morning. Sunday 9/16/18 working on vehicles again, this time in the road. This has been a complaint over and over by the neighbors in this area. I don't even live around this area and I feel bad for the people who do as their requests are getting ignored. The people complaining are homeowners who pay Pinellas Park taxes. Why is nothing being done? When it rains, the water does not drain properly causing water to sit on top of the street. There is a manhole where the area floods, but does not seem to help with the drainage issues. Even after it stops raining it takes more than a day or two for all the water to completely evaporate. When it rains every day, the issue gets worse. This issue has still not been addressed. With frequent raining, this area is a breeding ground for mosquitoes and other bacterial issues. Have turned a single family home into a multy-family home,screen enclosure turned into 2 bathrooms and 2 kitchens,currently approx 3 to 4 families under same roof,homeowner scamming the system not reporting over $1,500.00 in rents every month due to new born baby and all government help they get, Homeowner installed plumbing and electrical and etc for both apartments. This trailer has a tarp over it, it has no license plate, and it has been sitting there for about 3 weeks now. Pothole on 37th Street just N of 106th AVE in N bound lane. This is in The Lakes. So far it is just through the asphalt but will grow worse with time. Impounded vehicles are parked on right of way beside the yard, looking very decrepit! I think they should confine their business inside the fence!